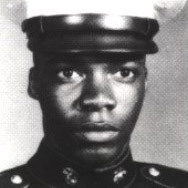 January 15, 1949 Oscar Palmer Austin, Medal of Honor recipient, was born in Nacogdoches, Texas. Austin joined the United States Marine Corps in April, 1968. He was promoted to private first class in October, 1968 and deployed to the Republic of Vietnam where he served as ammunitions man with Company E, 2nd Battalion 7th Marines, 1st Marine Division. On February 23, 1969, Austin’s actions earned him the medal, America’s highest military decoration. His citation partially reads, “Private First Class Austin’s observation post was subjected to a fierce ground attack by a large North Vietnamese Army force supported by a heavy volume of hand grenades, satchel charges and small arms fire. Observing that one of his wounded companions had fallen unconscious in a position dangerously exposed to the hostile fire, Private First Class Austin unhesitatingly left the relative security of his fighting hole and, with complete disregard for his own safety, raced across the fire-swept terrain to assist the Marine to a covered location. In recognition, the Medal of Honor was posthumously presented to Austin’s family by Vice President Spiro T. Agnew on April 20, 1970. The destroyer USS Oscar Austin was commissioned in 2000 and the Austin Hall Enlisted Club at Quantico Marine Corp Base is named in his honor.